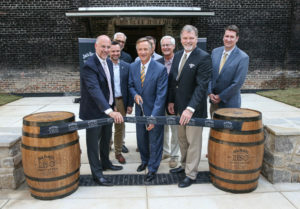 Tennessee Governor Bill Haslam, state officials, Master Distiller Jeff Arnett and representatives from Jack Daniel’s celebrate the opening of the enhanced visitor experience at the Jack Daniel Distillery. The Jack Daniel Distillery recently announced the official opening of Barrel House 1-14 and the reconstructed Motlow House as part of its 150th Anniversary celebration. Both facilities will be highlighted aspects of the guest experience in Lynchburg, with the Barrel House now featured as part of the expanded tour offerings. The opening was commemorated with a ribbon-cutting ceremony in Lynchburg with special remarks from Tennessee Governor Haslam. Z-CARD pocket maps were distributed as part of the celebration. The cards feature a map of the Lynchburg facility and a diagram of the distillation process. “In 2016, our 150th year, we anticipate nearly 300,000 guests visiting us in Lynchburg, where every drop of Jack Daniel’s is made,” said Jack Daniel’s Master Distiller Jeff Arnett.